Ensure that every part of the system is well documented. Train new stuff in related fields and ensure their integration in the ongoing process. Define and summarize future improvement possibilities for the software. Consult fellow developers on Java/Spring Framework topics. Regularly monitor OS level and application level security an UNIX servers and apply patches and security fixes when needed. Help integrate new third-party products into an existing environment. Skills Initial setup and maintenance of Linux servers in a heterogeneous environment. Analyzing hardware and software system requirements for third-party and internally developed software with subsequent implementation of these requirements. Monitoring security state of UNIX infrastructure and providing solutions to security problems as well as ensuring proper integration of this solutions with different OS based business software within existing environment. Basic software building and [re]packaging (RPM). I'm not a professional Linux administrator, but I can accomplish most tasks with the use of online and offline documentation of the system. Wrote technical documentation/manuals for projects which were developed either by me or by the team I've bean leading. Languages: English, Russian, Georgian. SVN/Redmine/Trac; NetBeans IDE; Vim (Advanced text editor); Maven; PL/SQL Developer; Oracle SQL Developer. API Design and implementation for Transmaster CMS; Several minor projects - information oriented web-services' backends. Technologies Java Web Services; Spring Framework (DI, JDBC/Hibernate, Web-MVC, Spring Security, Integration); XStream; JDBC (Oracle, MySQL). Application Servers and Managed Environments knowledge JBoss Application Server (basic feautres); Apache Tomcat; GlassFish (basic feautres). I started working in IT field in 2006 after finishing my second year in the Tbilisi State University, at that time I was involved into programming contests movement in Tbilisi. I and two more programmers from this movement were hired by JSC Georgian Card to create a credit card processing software. We successfully accomplished this project. After that we became a part of the Georgian Card's New Product Development Centre. There were several interesting projects after that, but the most interesting one was integration of HSBC bank and Georgian Card, where I took part in each step of creation - from design and implementation to final testing and launch. Working on this project was very interesting, our team has learned many things. After that I tried some other positions, like Testing & QA and System's Administration, in the same company - to get a broader view on the IT in general. I've started my job at Global Stream Georgia at the very beginning of it's existence. Systems and Software Architect role allowed me to gain some experience in from-the-ground design and implementation of a business software platform. 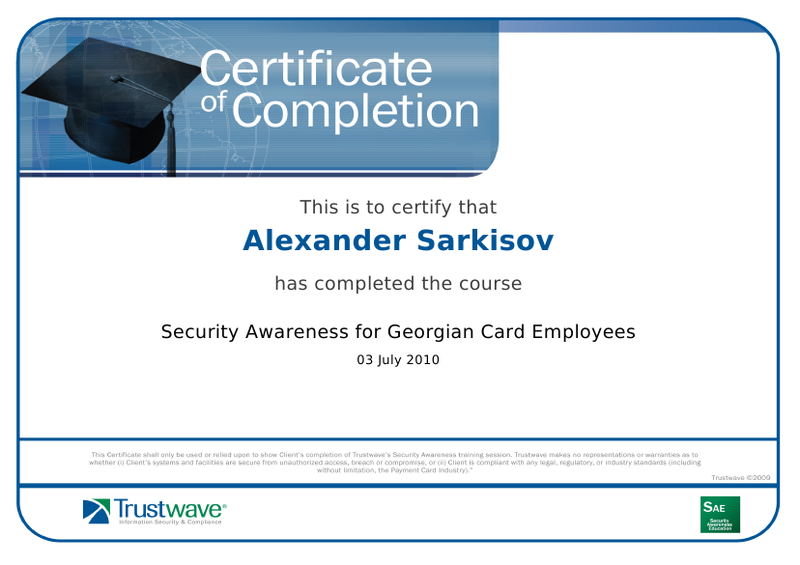 For now while continuing to work in Global Stream Georgia I also participate as associate engineer and/or consultant in non-related projects from different companies, e.g. Singular Group LLC (project finished), "Unison" Insurance Company, LLC (ongoing).